DanTam Stamped Concrete - Licensed Nature Stone Dealer and Stamped Concrete Contractor. 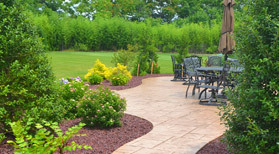 Dan-Tam Stamped Concrete is a reputable small family owned stamped concrete business located in Dillsburg, PA. With over 20 years of experience, we specialize in designing and installing the exterior stamped concrete patio of your dreams. We offer a wide variety of patterns and colors to meet any customer's preference. Please view our gallery, patterns and color charts to see all we have to offer.